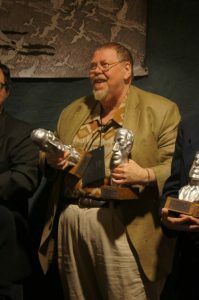 It has been a few weeks since Gardner Dozois died. I’m still having a hard time coming to grips with it. He was such a huge presence in the field, such a gigantic personality, it still seems inconceivable that he’s gone. I posted about our friendship below, about the laughter he brought with him wherever he went… but I wanted to write about his legacy as an editor as well. It’s been harder than I anticipated. Every time I start this post, it hits me all over again, and I realize that I will never see him again. I need to say something, though. Not for Gardner — there are dozens of memorials all over the net, speaking of his talents — but for myself. There’s really not much that I can say that has not already been said. As an editor, I think, Gardner had few peers. Over the decades our genre has been fortunate in having a succession of amazing editors: H.L. Gold, Anthony Boucher, Terry Carr, Damon Knight, Robert Silverberg, Donald A. Wollheim, Cele Goldsmith Lalli, Ellen Datlow, Ben Bova, Ted White, Fred Pohl, and Groff Conklin all come to mind, and many more. But two figures tower above them all: John W. Campbell, the editorial genius who gave SF its Golden Age, for whom not one but two memorial awards are named… and Gardner Dozois. His stint as editor of Asimov’s can rightly be compared only with Campbell’s decades at Astounding and Analog, and was similarly influential. He discovered and nurtured more new talents than I could possibly remember or recount… among them, myself. Not at Asimov’s, no. I was already well established before Gardner got that gig. No, he found me long before, in his first editorial job… reading the slush pile at Galaxy. It was in that pile, in the summer of 1970, that he came across my short story “The Hero,” and passed it along to editor Ejler Jakobsson with a recommendation to buy. That was my first professional sale, and came during the summer between my senior and graduate years at Northwestern, when I starting to seriously contemplate what I wanted to do with my life. That sale, and the publication that followed, went a long way toward making that decision for me. It’s no exaggeration to say that I might not be where I am today if Gardner had not fished me out of the slush pile in 1970. Many decades later, I had the honor and privilege of working beside Gardner on a series of anthologies that I am still very proud of. We were both huge Jack Vance fans, so the idea of a doing a Dying Earth anthology was a natural for us… and when Jack gave us permission, we were thrilled. SONGS OF THE DYING EARTH was a tribute anthology as well, and the best kind: one that Jack Vance was actually able to read and appreciate while he was still with us. I hope he liked reading that book (the tributes at least) as much as Gardner and I liked doing it. I’ve never met anyone who was as well read in SF and fantasy as Gardner Dozois, but like me, that was never all he read. He loved mysteries and thrillers and historicals as well; so long as the tales were gripping and well told, he never cared what the imprint was on the spine. So the next thing we tackled after the Vance books were the crossgenre anthologies: massive books with very broad themes, featuring work from outstanding writers from a dozen different genres. WARRIORS was the first. It did so well that we soon followed it with DANGEROUS WOMEN and ROGUES. Those did even better. They won awards, got great reviews, and even more importantly, introduced thousands of readers to some great new writers they might never have encountered, if we hadn’t put them between covers with their familiar favorites. Gardner and I did a couple of fun genre mash-ups as well. There was DOWN THESE STRANGE STREETS, crossing private eye stories with fantasy and SF, and SONGS OF LOVE AND DEATH, an SF/ fantasy/ romance hybrid. Last, but definitely not least, were our two “retro SF’ collections, OLD MARS and OLD VENUS. Damn, those were fun to do. Gardner and I shared a deep deep affection for the lost solar system of our youth, the Mars of the canals and dead cities and vanished races, the Venus of endless swamps and dinosaurs and web-footed Venusians. And we discovered, to our delight, that a lot of writers shared that love, and had been waiting all their lives for a chance to set a story on the Mars and Venus of yore. Those books were easy to edit; we had to beat off writers with a stick. Both books won awards. The sad part is, it ended there. I didn’t want it to. Neither did Gardner. I loved working with him, and we had more anthologies we wanted to do. We wanted to follow OLD MARS and OLD VENUS with OLD LUNA, and maybe down the line OLD MERCURY, or a book set in the asteroids. Done retro, like the first two. We talked about doing more crossgenre books. A second WARRIORS, a second ROGUES, a second DANGEROUS WOMEN, maybe one called VILLAINS or HEROES or (this would have been fun) SIDEKICKS. The publishers were interested. The earlier books had sold very well. Gardner was interested. I was the one who demurred. As proud as I was of those books, as much as I enjoyed working with Gardner, I did not have the time. 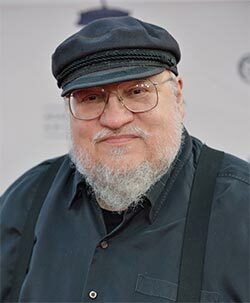 WINDS OF WINTER was late and getting later, and the editing had taken more of my time and energy than I thought it would. “I can’t take on anything more right now,” I told him. “We’ll do them later, once I’ve delivered WINDS.” So Gardner went on to edit THE BOOK OF SWORDS and THE BOOK OF MAGIC by himself (he could have edited all these books by himself, he never actually needed me, we just enjoyed working together). I contributed stories to both books (a reprint to MAGIC, since I did not have the time). There would be plenty of time to do ROGUES 2 and OLD LUNA and SIDEKICKS and all the rest, after all. All the time we needed. Just as soon as I got King Kong off my back… we even kicked around the notion of a reprint anthology we wanted to call THE HUGO LOSERS. After all, we were the guys who founded the Hugo Losers Party… just yesterday, in 1976…. We’d do all these books tomorrow. Next month. Next year. Real soon now. He’s gone now, and I fear he has taken all those books with him. I may edit other anthologies in the future (in addition to the Wild Cards series, which I imagine I’ll be editing till I join Gargy at the Great Worldcon in the Sky), but I could never bring myself to edit those particular books, the ones we had talked about doing together. It just wouldn’t feel right. Gardner Dozois won fifteen Hugo Awards as Best Editor, a record that will never be broken, I expect. He and I won some Locus Awards and a World Fantasy Award as well, and I will always cherish those. It was an honor to know him, and to work with him. I miss him so much.